Many people under the age of 21 think it is okay to consume alcohol as long as they stay under the 0.08% limit. It is true that according to the law, intoxication is defined as having a blood alcohol level of 0.08% or higher and driving under the influence of alcohol if behind the wheel. That law only applies to people who are twenty-one or older. It is illegal for a minor to have any alcohol in their system. So if a law enforcement officer sees a minor holding an object that contains alcohol or drinking, even if it’s just a sip, they can cite that individual for being a “minor in possession”. A guilty plea to a misdemeanor means you’ll have a criminal record. If you plead guilty the judge must suspend your driver’s license for one year. No matter what the evidence is, you can’t afford to be without a driver’s license for a year. If there is a way to get the case dismissed, reduced, or even to save your driver’s license, WE KNOW HOW. Contact the competent, aggressive California underage DUI attorneys at Wallin & Klarich at (619) 239-5051. 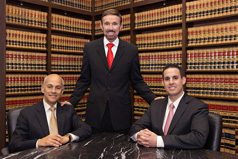 If you have any questions about a criminal matter, feel free to check out our website at www.wklaw.com or give us a call at any time at 888-749-0034. to discuss how a Wallin & Klarich attorney can help you.